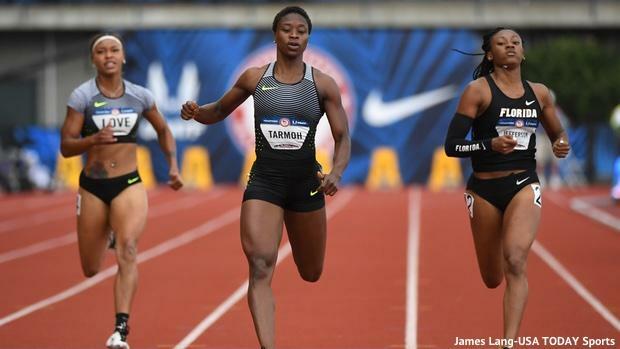 Jeneba Tarmoh is an Olympic gold medalist and world-class sprinter. She won a gold medal in the Olympics as part of the 4x100m team but she also has world championship medals, including a silver from Moscow 2013 in the 4x100 and a gold from the World Junior Championships in Bydgoszcz from the 100m. In college, she competed for Texas A&M where she was a decorated athlete. This transcription is from an interview FloTrack conducted with Tarmoh in 2013. The one-two step and bend over . . . that's how you learn how to sprint? Or at least come out of the blocks? "(The) one-two step just sets you up, gets your feet down as quickly as possible right when the gun goes off. The gun goes off, boom, one-two. If your feet are moving fast, then your body parts are moving fast as well. He tells me to bend over, literally fall forward like this (she leans forward) and just don't come up; that's what I was told do not come up before 20 meters (for the 100m)." "A lot of times people tend to lose speed and acceleration because they just get tired. So when I hit the tape, I take a deep breath and it just slingshots me into that person I'm giving the baton to. So when I think that, I'm about two, three meters away from them, I yell 'hit' and when I see their hand I place it. You see (and) then place, see then place, see then place." "The baton is coming, so right now I am looking at the person behind me and seeing how fast they are coming at me. Sometimes you've got to gauge, because when you have the tape there and they are coming too fast you might not explode out as you should or as quickly as possible. So I'm looking at how fast they are coming. I'm looking at their feet, and once they hit that tape I am powering out as fast and as powerful so I'm just moving. When I hear them say 'stick' I pump my arms one, two, then pump my arm back with an open palm ready to take the baton." "Right now the baton is in my hand. I grab the baton. I don't wait until they give it to me because I don't want to take any chances on the baton falling. So with the baton in my hand, I make sure that it is in the right place. I don't want to get the middle of the baton; I want the end of the baton so if you can you just shuffle your fingers to move it where you need it to be. If it's in a good position, you hold on tight to that baton and you just run like you would any other individual race." When things go wrong in the relay, what happens? Why is the baton hitting the ground? "From my experience, they usually say it's the incoming runner's fault. Why? Because they can see it. The outgoing runner is blind so if the baton hits the ground it's because the incoming runner let go too early or they just weren't patient enough; they didn't see the had and put the stick in there." So what does the incoming runner have to do to fix that? What's important for an incoming runner to avoid those mistakes? "To avoid those mistakes, you kind of just want to wait for the hand; you wait until they say 'hit' or 'stick' and you place it in their hand. You let them grab the baton away from you, and that's what I always do. Sometimes you're going to come across an athlete whose hand shakes, and you can't really give someone a baton when you don't have a steady target. So . . . you grab their hand and you place the baton in there." You grab their hand with your other hand? "Grab it and place the baton in there." "And you've seen it happen before?" "Yes, that definitely has happened." "No, I want to though." Doesn't it cause too much of a tangle up between the two athletes?